New discoveries in the field of stem cells increasingly dominate the news and scientific literature revealing an avalanche of new knowledge and research tools that are producing therapies for cancer, heart disease, diabetes, and a wide variety of other diseases that afflict humanity. 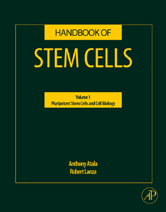 The Handbook of Stem Cells integrates this exciting area of life science, combining in two volumes the requisites for a general understanding of adult and embryonic stem cells. Organized in two volumes entitled Pluripotent Stem Cells & Cell Biology and Adult & Fetal Stem Cells, this work contains contributions from the worlds experts in stem cell research to provide a description of the tools, methods, and experimental protocols needed to study and characterize stem cells and progenitor populations as well as a the latest information of what is known about each specific organ system.